Econo Self Piercing Grommet Machine with #2 Stainless Steel Die included. Easy to use, perfect size for any location. This machine is economical, but built to last as it is made of cast iron. 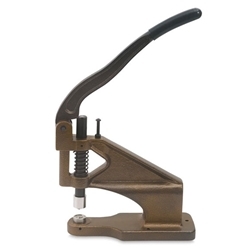 It features a level mechanism that's as simple to use as a stapler. Simply place a grommet on the top die and a washer on the bottom die, position your work and then pierce. The lever has a rubber grip for comfort.